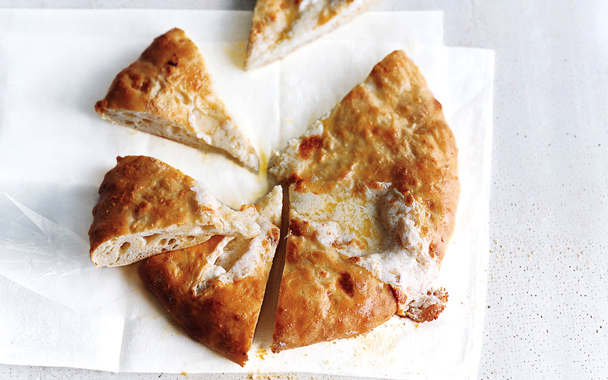 This rich Georgian cheese bread – known as khachapuri – is offered to guests as a snack or eaten as fast food in Georgia. It is always served straight from the oven. It is made in a variety of shapes and can be stuffed with different types of cheeses – but sheep’s milk cheese and fermented yoghurt is one of the most common combinations. Serve with pickled vegetables and chilled vodka. Makes 8 individual breads. 1. Place yoghurt, egg yolk, sugar and salt in a mixing bowl, and mix well. 2. Add the flour and baking powder and knead together into soft dough, adding more flour if the dough is sticky. In a warm spot in your kitchen, leave to rise for at least 1 hour. 3. In another bowl, combine the cheese with the egg and seasoning, and mix well. 4. Pre-heat the oven to 200C/ 400F/ gas mark 6. 5. Divide the dough into 8 portions. Roll out each portion in turn on lightly floured surface into 5 inch/ 12 cm rounds. 6. Put a couple of tablespoons of the cheese mixture into the centre of each round, then bunch up the sides and twist the tops to seal, flattening them slightly. 7. Roll each dumpling-shaped stuffed dough into 6 inch/ 15 cm rounds on a floured surface. Repeat with all 8 portions. Place on a greased baking tray and bake for 15 minutes. 8. Brush the hot bread liberally with melted butter before serving.